The subject is presented in a popular science format, and can be comprehended by anyone who is interested in understanding the flow of the Ultimate Makeup (i.e. the Universe that includes our "perceptivities"). To acknowledge the beauty that Mathematics and Physics offer in unraveling the truest nature, which at the outmost level reamins hidden from our direct sight. Here, mathematics and physics are only utilized to help understand what lies beyond what we see. Glimpse the introductory presentations from the links below. Why the Universe is the way it is? How do we exist relative to the Universe? Why the Universe is Mathematical? How the Universe operates as an entity? What is Our role in operations of the Universe? How do we combine what Science reveals with what Self Realized say? The Universe is unified through the Laws of Physics. Matter-energy exists through physical laws. The way physics operates locally is the same as in the most distant galaxies we sight. The more we study the more we find that mathematics reflects the universe and vice versa. Mathematical number patterns are found in every aspect of the nature and the universe. Not only does the physical world but also our choices and creativity display the same mathematical patterns. 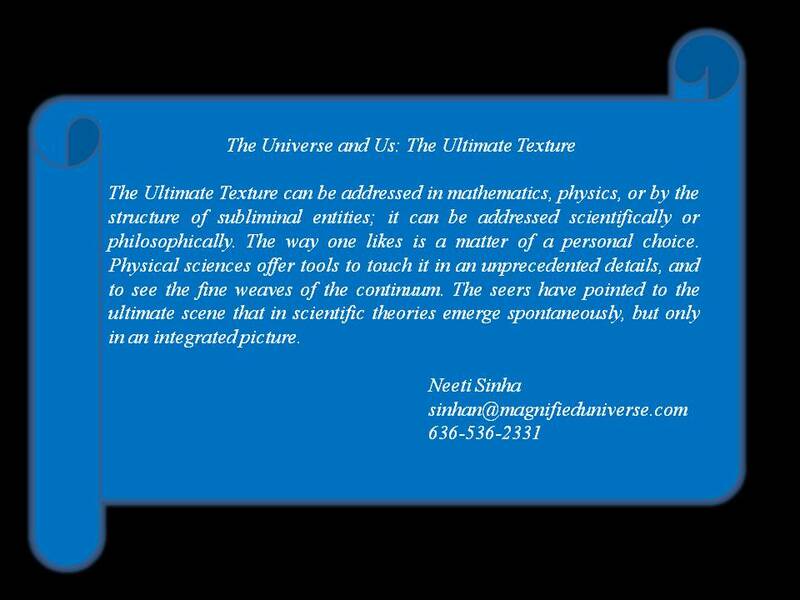 In fact mathematical concepts and formulations themselves illustrate the way universe exists and goes on.It is as if the universe exists in the language of mathematics. Even though its existence cannot be proved. We all have a set of elements existing inside us- thoughts, emotions, memories, dreams, images and creativities. 1. What the concepts in mathematics and the theories in physics tell us on how we exist In the universe. 2. How mathematics, advanced physics, and the way we perceive the universe support a unified picture, where "consciousness" become a part of the space-time continuum. 3. How the parallel universes that subsume "consciousness" pound. And importantly, how we can reason out certain scientific perplexities by envisioning an integrated scheme. 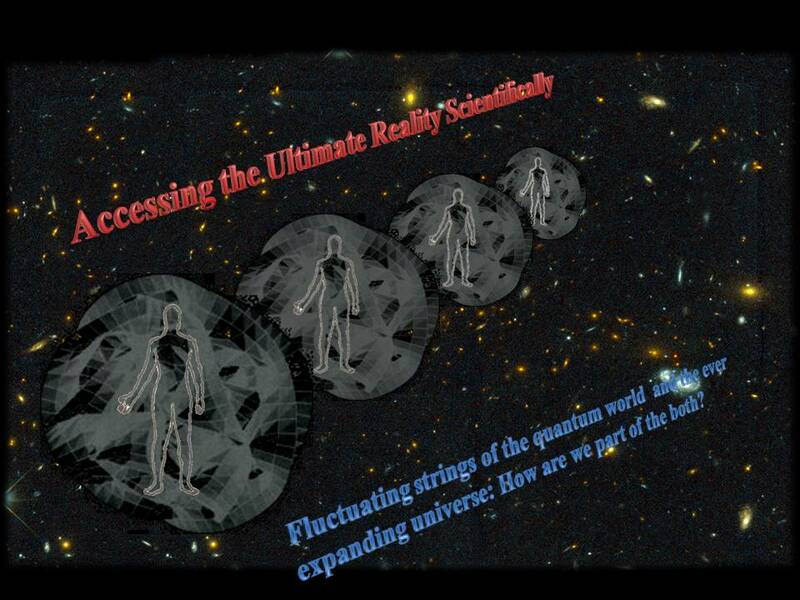 The above banner highlights the presence of the human through the quantum to the cosmic worlds. The spherical illustration surrounding the human is a mathematical object Calabi-Yau manifold. The Calabi-Yau space beautifully explains multi-dimensions, beyond that of three we encounter. The Calabi-Yau space is also illustrative of string theory (in physics), which proposes to unify all mass-energy forms, including those existing at quantum levels, with the universal forces. The subject of this initiative introduces how human as an entity is a part of the quantum as well as cosmic realms. How human exists through constant quantum fluctuations as well as through ever expanding universe is the subject of this initiative.